Local governments offer taxpayers the option of investing in bonds in exchange for tax-free interest earnings. In return, governments have money that they can put toward projects like bridge construction and hospitals. 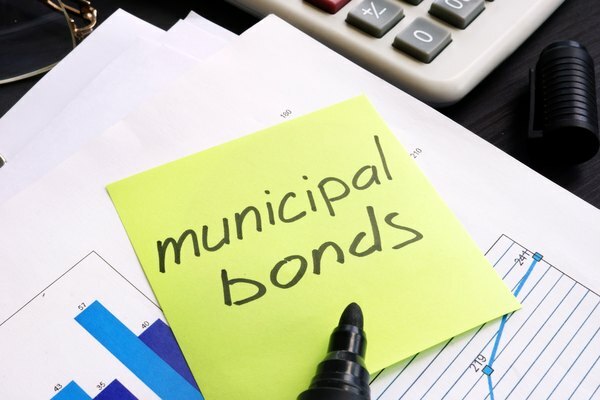 Municipal bonds basically serve as a loan from you to the government, which holds your money for a fixed period of time and pays you interest on that loan. There are both tax-free and taxable forms of municipal bonds, but the tax-free version grants you a federal tax break. Even though the interest you earn on your tax-free municipal bonds isn’t taxable, you’ll still need to report it to the IRS. At tax time, you’ll receive a Form 1099-INT, Interest Income, from the bond issuer. In Box 8, Tax-Exempt Interest, you’ll see the tax-exempt interest you earned during the tax year. You’ll input this information into Form 1040, line 2a, which is designated for inputting this type of interest. As with other types of investments, municipal bond rates fluctuate. You can earn interest at rates much higher than other investments, though, with rates reaching higher than 5 percent in some cases. There’s also a benefit in the fact that you can buy them and earn those higher interest rates without being pushed into a higher tax bracket. Not all bonds are tax exempt, so it’s important to pay close attention when you’re looking for a vehicle for your investment dollars. If you purchase tax-free municipal bonds at a market discount, you may have to calculate the difference between the full-price amount and the price you paid and pay taxes on that amount. For those who pay the alternative minimum tax rather than ordinary income tax, you may have to pay taxes. The interest you earned on your tax-free bonds could also bump up your adjusted gross income if you’re receiving Social Security benefits, requiring you to pay taxes. Another instance where you may have to pay taxes on your municipal bonds is if you don’t hold them until maturity. In that case, you’ll have to pay capital gains taxes on the interest you earned. The amount you get on the sale may differ from the value you saw on your most recent brokerage statement, so you may not even get the full amount of your principal back. If you get more than you paid, you’ll pay taxes on those gains of 0, 15 or 20 percent, assuming you held the bond for one year or longer before selling it. If the bond was in place for less than a year, you’ll pay ordinary income taxes based on your tax bracket. Lastly, municipal bonds may be tax-exempt, but that may not cover you when it comes to local taxes. If you purchased the bond from your own state, chances are it will be tax-exempt when you file your state taxes. But if you earned interest from a bond you purchased outside your state, you’ll have to pay taxes on that when you file your own state income tax. Municipal bond rates vary depending on current interest rates. Since your interest will be vulnerable to market fluctuations, it can often be tough to decide between a long- and short-term bonds. Short-term bonds are less risky, especially when the economy is healthy. One way investors reduce their risks on municipal bond rates is to use something called “laddering,” which involves purchasing multiple bonds with different maturation dates. That helps safeguard against rising interest rates. You can purchase a combination of long- and short-term bonds to keep the overall yield of your portfolio high. Tax-free bond funds can be ideal for non-grantor trusts, which look for tax-preferred investments to offset the higher tax bracket. This is because non-grantor trusts are treated as taxable entities, unlike grantor trusts, which report any interest on their tax return. A grantor trust, on the other hand, may be more likely to seek out a taxable municipal bond. If you die and a municipal bond is passed on to your heirs, there won’t be inheritance tax on the amount since municipal bonds are nontaxable entities. Since it’s a conservative investment better suited for an older investor than a younger one, experts recommend that heirs consider looking into putting that money elsewhere once it matures if they want to continue earning money. There are two major types of tax-free bond funds: obligation bonds and revenue bonds. General obligation bonds leave the method of repayment open, promising to use the issuer’s full credit and taxing authority to make sure the loan is paid back. If the issuer lacks the funds in its current budget to pay out the amount due at maturation, it will have to pull from some type of tax to come up with the funds. The courts can get involved and order repayment if a general obligation bond is not repaid in a timely manner. Revenue bonds, on the other hand, are guaranteed by the revenue that the issuer brings in. A revenue-generating entity like a hospital or transportation authority should be able to repay its bonds with the money customers pay on a regular basis. Even issuers like the water company can repay bonds using the money coming in from customers. Since not all revenue-generating entities are equal, some revenue bonds are more reliable than others. If you’re interested in tax-free bond funds, it’s important to pay attention to the credit ratings for the bonds you choose. The higher the credit rating, the more likely the issuer is to be able to repay the bond at the time of maturity. The most creditworthy issuers are rated as AAA, while riskier investors can be rated as low as C, D or DDD. At the lower end of the rating range, issuers may be in default on previous loans. To reduce your risk, look for issuers with a credit rating of BBB, BAA or better. You can also search for issuers whose debts are backed by insurers who will take care of the debt if the bond issuer goes into default. You can research a bond’s rating on Moody’s site. You’ll need to set up an account but once you’re in, you can get information on an issuer’s rating and weekly credit outlook. One consideration when you’re looking at tax-free municipal bonds is whether or not your investment is callable. Municipal bonds can be called, just as corporate bonds can. This means that at any time, the issuer can send a notice to investors to say the principal will be refunded. Although this can seem like a risk, it actually is a benefit to investors, since the primary reason a bond will be called is if interest rates drop. But if you’re concerned about the callability of your municipal bond, you can take advantage of something called call protection. With this in place, there is a fixed period of time in which the bond can’t be called. If you do choose to invest in a callable municipal bond, you should make sure it offers a higher yield than similar bonds that aren’t callable. State and local tax laws vary. Check with your taxing authority to see whether you must report the tax-free bond interest on your state or local return. Dave Ramsey: What About the Inheritance Tax? What Are Tax Exempt Mortgage Revenue Bonds? Can Savings Bonds Be Tax Deferred for College Tuition?